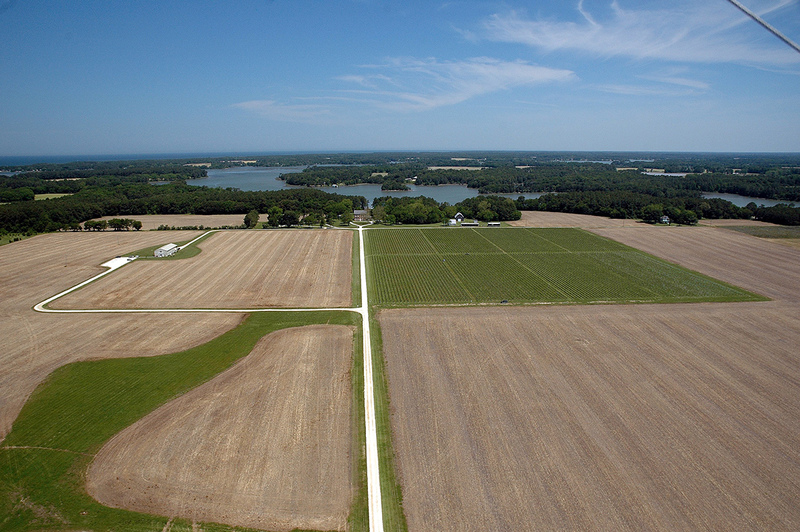 Virginia’s Eastern Shore was established as an American Viticulture Area (AVA) in 1991. Since then six vineyards were established and two wineries opened tasting rooms. The terroir is distinct from mainland Virginia. About 35 million years ago, a meteor slammed into the earth at a location that is now the southern tip of the Eastern Shore, displacing much of the soil and fragmenting the shell and mineralogy. Sandy loam, well-drained soils rich with ancient shell and a long maritime climate greatly benefit winegrowing here. Chatham Vineyards was established in 1999 by Jon Wehner, a second generation Virginia winegrower. His Church Creek Steel Chardonnay is grown and crafted especially for seafood pairings. This crisp, unoaked white wine is a pure expression of Chardonnay with strong notes of honeysuckle, pineapple, with crisp citrus acidity and mineral elements. Wine & Brine month touts the hyper-local benefits of growing grapes within steps of some of the best aqua farming in the country.